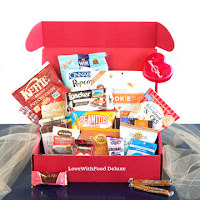 Frugal Mom and Wife: LoveWithFood Snack Box ONLY $5 + FREE SHIPPING After Coupon! LoveWithFood Snack Box ONLY $5 + FREE SHIPPING After Coupon! **Be sure to select the monthly billed plan to be charged once monthly. You are not required to keep your subscription once you have signed up. This coupon code is valid for first time orders only.